I've been making recipes every week from the Herbfarm Cookbook over the past 3 months. I enjoy doing photography projects, especially those that include food. My first food photography project was Food A-Z. It was challenging at times as well as fun and also provided me with several photos to submit to my Getty Images Collection and gave me something to blog about. One of those photos has turned out to be one of my best sellers. So far, I have 4 of my images from this cookbook project available for licensing and will hopefully have more soon during the next review. I have decided to make my cookbook project a series of projects. I have completed my Herbfarm project and plan on starting a new project soon using recipes from The Newlywed Kitchen Cookbook by Lorna Yee and Ali Basye. 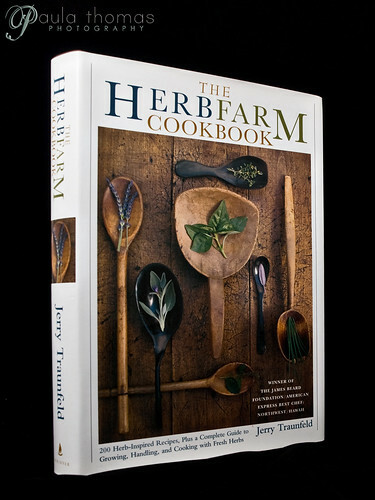 I plan to have Mark help pick out some recipes to try, but before I start on that I want to conclude my Herbfarm Project by posting my review and giving my thoughts on the cookbook and my experiences with it. I don't think there was a single recipe I made that didn't turn out tasting good and there were a few recipes that I made more than once because they were so good. My favs were the balsamic potato salad and the lavender shortbread. I also loved the tarragon butter sauce that went with the poached halibut. 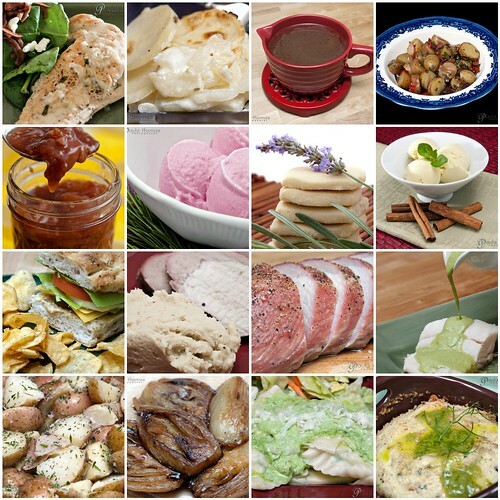 There were a few recipes I ran into that gave alternative herb combinations to try, not because they were hard to find herbs, but just for different flavor combinations. There were a lot of herbs and vegetables I used for some of the recipes that I had never had before. Because of this cookbook, tarragon has become my new favorite herb and was encouraged to plant some in my herb garden this year, along with chervil and lovage. I cooked with fennel and lavender for the first time and made homemade pasta and a souffle for the first time. I had a lot of fun trying new things. Many of of the herbs that were in the recipes are impossible to find unless you have them growing in your own yard or know someone who does. ie. lemon verbena, chervil, lovage, black pansies... I couldn't find any of these anywhere so I either ended up not making that recipe or used an alternative that might come close to what the herb tastes like. For hard to find herbs, an alternative herb or combination of herbs should be provided. I was a little disappointed with the dessert section. It was mostly ice creams and there was a whole section dedicated to sorbets which seemed a little unusual. I would have liked to see more baked desserts. This is probably the first cookbook I've ever bought that doesn't have pictures with the recipes. The recipes need to be very well written if pictures aren't included, which they were, but including photos would just make the cookbook all that much better. There have been times I've bought cookbooks just because the photos looked so good. The recipes in this book are so good they really deserve to be photographed. Below is the list of sections included in the cookbook and links to my blog posts with additional photos of those I tried. I had originally planned on doing one recipe per category but I couldn't resist doing a few more. If you're turned off by cookbooks with no photos like I usually am, maybe this will encourage you to challenge yourself with this photo lacking cookbook. Wow, you really did make a lot of the recipes in the book. Great! The photos look nice, too. I really like photos in cookbooks. I might not have bought the book if you (and others) hadn't said the book was so good (especially when I was in my "lavender phase"... hah!) I still haven't cooked from it, but I definitely will. I love potatoes, too, and those all sound incredible! I made a few things with lavender. The lavender shortbread turned out great. There was also the potatoes with lavender and rosemary and the plum and lavender chutney. This is a fave cookbook of mine but I find myself returning to the same recipes over and over again instead of exploring it in depth. You have inspired me to explore those pages that are not spattered!